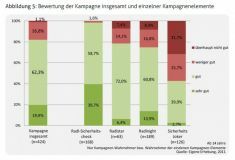 Evaluation of the campaign "Cycling City Munich"
The City of Munich has set itself the ambitious goal of increasing the modal share of cycling to 17% by 2015. 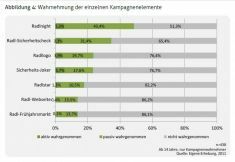 For this reason municipality started a campaign in 2010 that is unprecedented in Germany at national level: a budget of 1 million euro per year in the first two years (0.6 million euro/year from 2012-2014) and a duration of at least five years. This marketing campaign to promote cycling has a consistent appearance and offers various events at neighbourhood, city and regional level. You can find the description of the campaign here. Assess as many possible impacts of the campaign as possible. Provide evidence for the success of the campaign in order to legitimise its continuation. Derive recommendations for further developing the campaign beyond 2012. As the campaign is still running the evaluation results presented here have to be considered as interim. Between 24 April and 8 May and from 22 May to 1 June 2011 a representative telephone survey has been carried out. These relatively long periods were necessary to compensate for weather-related influences on mobility behaviour and to get a picture of it before and during vacations. In addition, the calendar of events related to the campaign was taken into account when planning the survey. Participation rate was high and came up to 51%. In each phase 375 interviews have been conducted. Through weighting the sample was adapted to match the structure of the population of the City of Munich and to avoid seasonal influences. The interviews have been limited to 12 minutes in order to increase people’s readiness to take part. A pre-test was made. Results show that the city’s population has generally a very positive attitude toward promotion of cycling: almost 60% very much approved of the city’s promoting cycling as a means of transport and another 36% approved. One third of the survey participants were aware of the campaign; another 27% remembered it when parts of the text used in it were read out to them. In the second survey phase, after numerous events and corresponding media coverage, the awareness level rose to 38% and 35% respectively. The number of people who were not aware of the campaign at all halved from the first phase to the second. Rating of the campaign was very positive: more than 80% of those who were aware of the campaign rated it good or very good. Only 1% explicitly disliked it. The content of the campaign was acknowledged too: approx. 85% considered the campaign an important contribution to the protection of the environment and action against climate change. Two thirds said it made them want to ride their bike, and only less than a quarter rated the campaign useless and without any significant impact. Two different methods (and data sets) have been used for the assessment of the modal split. Answers from the telephone interviews provided input; this was checked against secondary traffic data that has been analysed (MiDMUC 2008 and a representative key date survey) with regard to modal split. The results imply that the campaign, in combination with political and infrastructural measures, is an important element in the promotion of cycling as a means of transport. According to the self-assessment of those who were aware of the campaign 13% have used their bikes more than before. Almost one quarter stated that they want to use it more in the future and 38% were confirmed by the campaign in their choice for the bike. One of the goals of the campaign was to improve road safety for cyclists. 15% of the interviewees who were aware of the campaign said that since the campaign they would drive more carefully. This matches the official statistics for road accidents in Munich according to which accidents involving cyclists have gone down. Furthermore, the secondary data showed an increase in the use of the bike compared to other modes of transport. It rose from 14% in 2008 to 17% in 2011. Correspondingly, the share of individual motorised transport decreased from 27% to 23%. 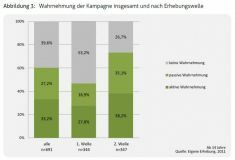 The assessment of the media coverage of the campaign was based on press clippings from local newspapers (Münchner Merkur, Abendzeitung and Tz) that were about the campaign itself or about cycling in general. As the campaign is being noticed at regional level too, the Süddeutsche Zeitung has also been taken into account. How did the public debate develop in the course of the campaign’s runtime? How is the topic being discussed? Which parts of the campaign are being discussed and rated? What role do those stakeholders play? Is power being exercised and if yes, by whom? The results of the analysis show that the campaign has raised a lot of media attention. Ratings were generally rather neutral and supporters as well as to objectors had their say. Print media dealt with the topic in more detail whereas online media compensated this with greater variety. The Cycling Night was rated rather positively, while the Safety Joker came off rather badly. The goal of the campaign to improve traffic safety for cyclists was undisputed. However, the way to get there has been discussed controversially. Central to the media debate was the question whether cycling can be promoted through so-called soft measures, such as the marketing campaign, or rather through infrastructural and legal measures. The campaign itself including its events was not criticised, apparently, because it did not give reason for that. The analysis further showed that print media had too little coverage of event details. Evaluators therefore recommend a Campaign Diary to keep interest high and at a continuous level. The analysis of the interviews showed that professional stakeholders have a very positive attitude towards the campaign that they consider unique with regard to its budget, its duration and its diversity. It is recommended to continue with the same financial as well as infrastructural engagement. However, there should be more focus on the target groups (businesses, trade, catering and hotels), public relations should be systematised and internal credibility could be improved by openly naming the deficits. Stronger involvement of the region; together with the city’s public transport operator (MVV) the region should get engaged for the development of regional cycling marketing – for the main routes the network planning should be promoted conjointly. The campaign should differentiate by target group and neighbourhood. Changed behaviour with regard to Bike&Ride through e.g. bike-sharing schemes or fold-away bicycles should be taken into account. The bicycle is being used more and more as a means of business transport and as carrier by e.g. mail and parcel services and courier services. Therefore, the campaign should focus more on businesses and organisations. The evaluation of the campaign should be repeated in order to allow for comparisons and for a deeper analysis. The Bavarian working group for bicycle-friendly municipalities could function as platform for further funding and conceptual development of the campaign as well as for its continuous evaluation. 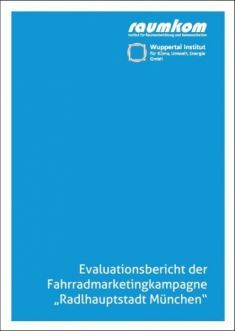 The short version of the evaluation report (in German language) can be found here. A compact information (in German) for the local parliament about the first year of the campaign and the planning for the second year including the evaluation can be found here.